Kacper Kozak (left) after his win in Newmarket. It was three wins out of four for Peterborough Police Amateur Boxing Club at the weekend. First up at the Corby Olympic dinner show were Imran Khan (17) and Kieran ‘Special K’ Cocker (21) and both hit a winning note. Khan boxed S. McNamee from the promoting club and he stopped his opponent in the third round with an awesome display of skill and power. Cocker fought C. McGreevey, also from Corby, and, thanks to some great combinations working inside, he won easily on points against a much taller and more experienced opponent. The third weekend win came from Kacper Kozak (15) at the New Astley ABC show in Newmarket. He battled it out toe-to-toe for three tough rounds with home fighter D. Allum and, being stronger on the inside, he took the ponts decision. On the same show Muhammad Khan (15) was unable to make it a full set of wins for Peterborough Police. He came up against a more experienced foe in the shape of Newmarket fighter J. Goodey and was halted in the final round when he stopped fighting back. Khan had struggled to find his range throughout and when he began to take shots waiting on the ropes, the referee decided he’d seen enough. 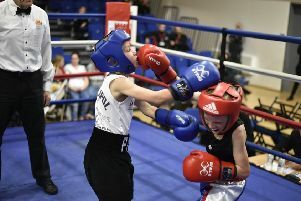 Young Ben Hutson (12) from the Peterborough Police club boxed H. Gillham from the New Astley club in a skills bout and acquitted himself well. Peterborough Police ABC are holding a dinner show at Peterborough Regional College on Friday May 5 when at least 12 Peterborough boxers are expected to be in action. For ticket details contact Chris Baker on 07921 095122.